In less than a fortnight our home town of Lewes in Sussex will be filled with thousands of visitors as the spirit of Mardi-Gras combines with the spirit of Samhain to create an extraordinary spectacle of fire, noise, music and celebration on Bonfire Night. There is now an online archive of old copies of the Ley Hunters magazine ‘Quicksilver Messenger’ and here is an article from that archive (sadly undated, but from the 1970s I suspect). In this article by local author Ward Rutherford, connections are made between the Druids’ ancient celebrations of Samhain and Lewes’ modern-day celebrations of Guy Fawke’s. The history may be wrong, his ideas about sacrifice in particular, but it still makes for interesting reading, particularly for locals who have often felt that the celebrations feel particularly Pagan. (See also the website with information on Sussex folklore and archaeology here). History is pro-Roman. Thus when Tacitus and Suetonius assure us that the last remnants of Druidism perished at the hands of the legionaries at Mona (or, as we now call it, Anglesey) in AD 62, the statement has gone virtually unchallenged. Yet it’s manifest falsity is easily demonstrable. That Druidism continued down to Christian times in regions untouched by the Roman sandal such as Ireland and Scotland we know from the statements of the missionaries themselves. ‘Christ is my Druid’, declares St. Columba, a turn of phrase surely meaningless if there were no Druids around. Even in those places where the people had reason to fear the Roman writ, there are signs of survival. One Druidic subterfuge was to take up the harp and pass oneself off as a bard. The separations of the two vocations had, in any case, come about only in comparatively late times. Merlin, who makes his first appearance in the Arthurian stories only in the Middle Ages is plainly intended to represent a Druid. He is, on the consensus of most scholars, derived from the Welsh Myrddin, a historical personage who was, in fact, both prophet and bard and sufficiently renowned to have a town (Carmarthen-Myrddin’s town) named after him. But if the Druids survived, in no matter what guises, are we justified in asking how far their beliefs and practices may have lived on? Roman influences have ensured that, until recent times, the very notion of such survivals was laughed out of court. If the Druids themselves had gone, how could their ideas persist? This requires a more than usual willingness to ignore facts distasteful to an accepted theory. Not only have Druidic practices and beliefs lived on, but they exert a greater influence on our lives than has hitherto been acknowledged. Though the proofs of this abound, one must serve. Throughout the British Isles one comes across the well and water sources dedicated to ‘St. Anne’ or to ‘St. Bride’ and one need go no further than Hove with it’s St. Anne’s Well Park in search of examples. By tradition, St. Anne is the mother, St. Bride or St. Bridget the midwife of the Blessed Virgin. They may, however, have an infinitely older ancestry. A goddess knowm as Brigantia or Brigid was to be found occurring right across the Celtic world and we know of an extremely powerful mother-goddess variously rendered as Dana, Danu, Anu or Ana. She may also be the prototype of the Roman Diana since the prefix ‘Di-‘ means no more than ‘the bright one’ and was frequently attached to god-names. (The J of’Jupiter’, is a case in point, for it is merely the’di’ ellided). Furthermore, the connexion between deities and water-sources is well-attested among the Celts. The names of their Gods – including Dana/Ana in the Welsh form ‘Don’ recur in the early Welsh versions of Arthurian legend, leading to the supposition that these were in origin myths encapsulating what one might call Druidic ideology. Imbolc, the lactation of the ewes, comes in February and survived until late times as Candlemas. It was certainly a day sacred to Bridgid and is celebrated as ‘St. Bridget’s Day’ in the Isle of Man. While Bron Trogain has yet to be identified, with the other two we are on firmer ground. Beltine is the festival of the great sun-god, Beli or Belenos and occurred on 1 May. We need have few scruples in associating the enormous number of May Day practices, such as village Maypoles, with it. In case doubts linger, there is supportive evidence from those places where Celtic life remained least disturbed by external influences; Ireland, the Scottish Highlands, the Channel Islands, the Isle of Man, the Orkneys and Shetlands. In the last three, the term Beltain is still in use and there are various local customs, such as well-visiting, associated with it. But it is perhaps Samain which gives us even more surprising examples of the quite extraordinary longevity of Druidic ideas. It occurs, as Emer’s speech makes clear even if we did not know it from other sources, at. ‘summer’s end’, in fact in late October-early November. It was not a festival devoted to a particular god, but a period in which the people of the Other World – the dead – could exert a baneful influence upon the living. It was the time when, according to Irish myth, the sidhs, (or shees), the prehistoric barrows, lay open and when their inhabitants tempted the living into them. Then it was that the sidh-women, the banshees, in the form of beautiful temptresses went in search of mortal lovers. However, having established that Hallowe’en is the successor of the Celtic Samain, we may yet overlook something else. From China to Mexico, wherever men have found the need to protect themselves from the malign spirits of the dead, they have adopted the same technique. It is that of instilling fear by means of fire, noise and the wearing of Eearsome masks. In the employment of these methods, the Celts were no exception. We know this from many sources. At once, and perhaps a little incredulous, we find ourselves being reminded of another well-known folk-festival – Guy Fawkes Night, which occurs on 5 November and is thus well within the accepted Samain period. Logic intervenes. Can this possibly be more than coincidence, it asks? It was on 5 November I605 that James I’s Parliament met and Guy Fawkes was found amid his powder barrels. But logic also prompts one to ask why the British people should choose to celebrate an occasion which had not the slightest effect on their history? If an occasion for lighting celebratory fires was required why not the anniversary of the defeat of the Great Armada less than twenty years earlier which changed British and European history? Except perhaps, that it occurred in August! There is, in addition, as aspect of November Fifth we should not overlook. It’s centrepiece is and has always been the burning of an effigy of a man: Druidism practised human sacrifice and both Beltine and Samain were occasions on which human offerings were made. An interesting parallel comes to us from the Channel Island of Jersey. There, until the Puritans forbade it, it had been the custom to fell a tree-trunk at New Year which, shorn of its branches was dressed in clothes and then burned. The overtones of human sacrifice are obvious enough. The log-victim was called in local patios ‘le bout de 1’an’, – the end of the year – and this was corrupted into the word ‘boulelau’. Strangely enough, the Guy Fawkes custom also spread to Jersey, despite the fact that what happened at Westminster had no conceivable relevance to the islanders who have their own Parliament, the Jersey States. That this was simply the older custom revived is proved by the fact that the word ‘boudelau’ was used for the Guy Fawkes dummy as late as my own boyhood in the island. All the same, these are no more than intimations which tempt us to conjecture and we have better evidence than this. Once again it comes from the most undilutedly Celtic areas. In the Orkneys, the Shetlands, the Scottish Highlands we find that Hallowe’en itself was traditionally celebrated with the lighting of huge, communal bonfires. As Ernest Marwick says in his Folklore of the Orkneys and Shetlands, Hallowe’en and November Fifth became inextricably confused. In the Scottish Highlands we are told, by no less an authority than Professor Anne Ross, the chosen site for these conflagrations was the summits of barrows – the Irish sidhs. In other words, fire was fulfilling itss age old function of protecting the living from the spirits of the dead. One is therefore led to the conclusion that fireworks, the bonfires, the burnings of Guys on November Fifth came about simply because these activities seemed especially appropriate to the season. The Gunpowder Plotters simply provided a convenient excuse. Inevitably, one is led from this to the consideration of the most spectacular of all November Fifth celebrations: those held in Lewes. Are the various bonfire societies, unknown to themselves, merely participating in a dark, pagan custom? Before we dismiss the notion as too fanciful we should remember that in this part of the Downs we are deep in Celtic country. Sussex is more or less coextensive with the Tribal territory of the Regni, a name hinting at royal antecedents (Rig-king). Next to it was that of the Cantii which became the focal point of the struggle between the Saxons Hengist and Horsa and that chieftain the history books misname ‘Vortigern’ (it is, in fact a title, Great Lord). Even at this late date after some four hundred years of Roman occupation, the chief of the Cantii was a devout follower of the old religion. The ‘magicians’ attributed him by Nennius were almost certainly Druids and are so named in some versions of his Historia Brittonum. The Saxon incursions marked the commencement of the Celtic Britons’ trek westwards. Among indicators of the importance of the area there is not only the Wilmington ‘Long Man’ – on the analogy of other hill figures almost certainly a god – but a host of archaeological finds including the Piltdown stone head and the dolphin linchpin found at Hassocks. The various discoveries unearthed at Caburn give plain witness that, as one writer puts it, the area was ‘inhabited from 500 BC to 50 AD by an artistic race who carried on many arts and crafts’. The last date may well be significant, for the period from roughly 50 AD was one in which the wholesale extirpation of Druidism in Britain began under Claudius. If this was an area of religious importance as there is reason to suspect, this may well have been the moment it’s leaders decided it would be prudent to move elsewhere. The bulk of local population would, of course, have stayed where it was, rooted in the land and it’s agricultural pursuits. Undoubtedly they would have kept up the festivals even without benefit of clergy. As added evidence in favour of the thesis that this was a stronghold of pagan releigion, there are the numerous Christian establishments in the neighbourhood, while the dedication of a church to ‘St. Anne’ is interesting if no more. It was common practice to erect Christian monasteries and churches on sites dedicated to the pagan deities, in many cases the materials from the temple or sacred enclosure being used for the new buildings. In this way the impotence of the old gods was effectively demonstrated. What I am suggesting, then, is that Lewes represents the epicentre of what was formerly an important Celtic area with strongly religious over-tones. In such an area one would expect the festivals, of which Samain with it’s similarities not only to Hallowe’en but also to November Fifth, to be kept up. The contemporary celebrations of November Fifth are simply, I suggest, a survival – or revival – of this. The photo on the left shows the War Memorial in the centre of Lewes with wreaths laid by Bonfire societies. 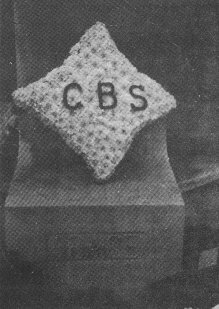 The right hand picture shows a close-up of a wreath laid by the Cliffe Bonfire Society with it’s initials CBS picked out over white carnations. The pictures were taken early in November I979. The questions which force themselves upon us are: why Lewes? But it is no more curious than the survival of other Celtic festivals elsewhere. Why, for instance, should Abbots’ Bromley in Staffordshire have retained it’s Stag Dance, plainly associated with the powerful horned god, Cernunnos. Why does Helston have it’s ‘Furry Dance’ or Padstow it’s ‘Obby ‘Oss’? Ward Rutherford was born in 1927 in the Channel Islands where he was imprisoned by the occupying German forces in the last war. He has been involved in radio and T.V. broadcasting and in I962 became head of news for Channel T.V. in St. Helier, moving to B.B.C. West Region in I964: Author of seventeen books on contemporary history as well as short stories and newspaper articles, his book The Druids & Their Heritage was published in 1978, but is now out of print. In Lewes there is a strong connection between the fifth as a fire festival and festival of the dead which echoes loudly a Celtic tradition. 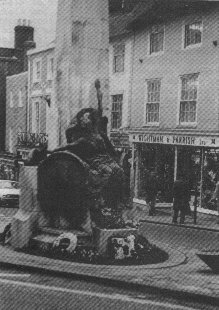 Each year on this day the several bonfire societies lay wreaths at the war memorial in the town centre. They further remember the dead of the two wars in a special Festival of Remembrance in the church of St. Thomas a Becket (a man chiefly remembered for his death) on the nearest Sunday to the fifth. It could be argued that this remarkable interlocking of two traditions originated with the burning of the Protestant martyrs. If this is so why is the martydom not more overtly remembered? What seems to have happened is this. An already extant tradition received a boost taking on a new meaning and interpretation from contemporary events. This continues into our own time with the Fire Societies honouring our fallen war heroes.